Collabs is an exhibition comprised of projects and studies exploring the post-digital human form under late capitalism through app development, photo-installation, sculpture and video. Corp-personal synergy and #apptivism are some of the main subjects surrounding this body of work. Lately I've been thinking a lot about the distances and relationships between aesthetic manifestations and formal realities under late capitalism, and how the ideas of which Marc Fisher speaks of in Capitalist Realism are becoming more and more like Total Reality: Expanded capitalism that (in)forms gestures, interactions, movements —and even our deepest contradictions. For many, our allegiance to Supreme, Apple, or Nike, has no relation with the real practices of capitalism that manifest themselves in the form of gentrification, human exploitation, war, and affections to ecosystems (social and natural). This distance is cushioned by the comfort of the screen: The car that picks me up with the hit of a button or the shoes delivered to my door appear (with no apparent repercussions) as phantasmagorical accessories to real life, which is almost directly experienced via our mobile devices. These predicaments are not new, they just have expanded to the point of flattening collapse: Marx portrays them as the fetishization of the merchandise, the anti-globalization movement in the 90s addressed them in a process of self-criticism and reflection, and Fisher (and another authors, such as Zizek) see them as integral part of capitalism: a closed loop. Now, post-capitalism feels much like post-apocalypticism: It is taken for granted that we were already condemned, that there was never an exit. Total collapse This affects our communications, our gestures and our expectations. Within this context I started considering the concept of Collabs, the contemporary practice in which artists associate themselves with a brand and interchange coolness value between them. But most of all, it made me think about how implicated we all are in all this, how that monster called capitalism is our greatest collab. I also felt a general interest in the human figure within this new post-capitalist / post-digital context —its anonymity and post-personal attributes— and how it becomes diffused as data and digital (or digitized) image. That is why animations and abstractions are the main subject of this body of work in which the person is absent but where there is a strong emphasized in the figure. The works that I propose are then some unrequested commissions I do in parallel with brands in a real and fictional way at the same time. Products, campaigns or absurd services that could easily be collabs. Or not. While researching Buddhism for my Nirvana project, I came across a famous Koan (zen meditation puzzle) that asks "What is the sound of one hand clapping? / How do you clap with one hand?" The silly/("western"?) answer would be "finger-snap!". I wanted to be more absurd and answer back with "How do you snap with one finger? Now there's an app for that!" This article from the NYT titled "Why Snapping Is The New Clapping?" is really great, its tagline reads "Because you can't applaud when taking a selfie or texting." This app obstructs that dynamic as well. With The Snapp, you CAN"T take a selfie or text. Your whole device power is used for snapping. The way the piece is presented in the space is by placing a real-life sized billboard into the gallery wall. This billboard depicts raised "fists" holding Apple devices with raised fist emojis in them. The print is stylized as an Apple "Shot on iPhone" billboard. 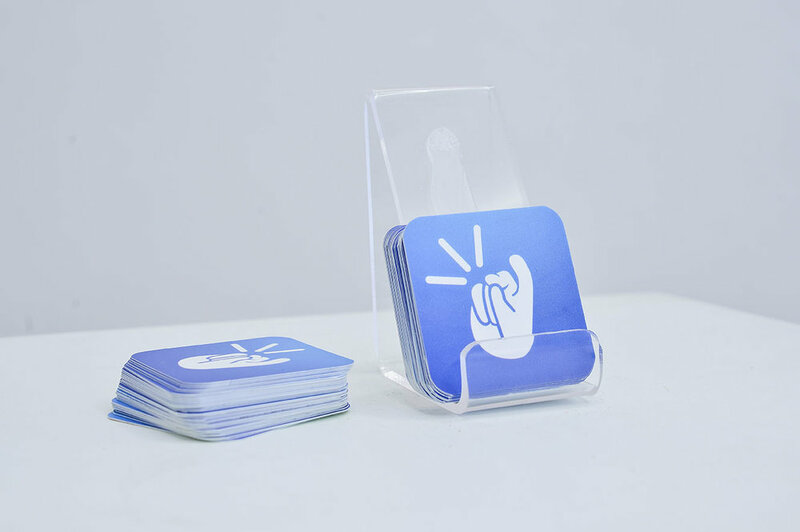 The plastic base is for placing a phone to experience the app and the cards have links and QR code for Android and iOS downloads. Air is a kinetic sculpture in the form of a round t-shirt rack in which an animation is articulated by motorized rotation. The animation depicts the Air Jordan logo, no basketball in hand but with a raised fist going up and down. I find the ideological loop of the Jordan brand to be quite interesting: A brand that has decidedly kept itself out of politics, but in turn is also embraced by activist communities while its products are still being produced under the most savage of capitalist conditions. 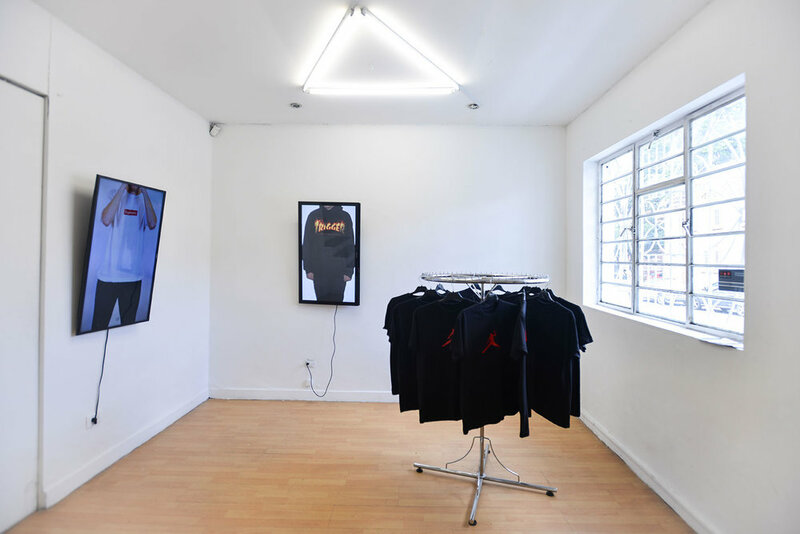 For the show in Bogotá, "AIR" was presented surrounded by two videos. I think one of them would go great for the show at Distillery, while the other needs more work. This is the video that I propose for distillery. I'm thinking that both AIR and this untitled video could co-exist in the same space maybe surrounded by shelves with copies of each "frame" of the animation in the form of t-shirts, like a store. 2. At this moment, the date of January 28 seems a little premature. I know we had discussed it before but some situations with the production of these pieces made my whole year timeline fall back a little. Would it be possible to have another spot later? If not, we could try to work it but the following points must be considered. The motorized rack for the t-shirt animation (this piece was sold in Colombia and now I would have to produce a copy). I could cover the costs for that from the sale but I would need an expert/technician to work with me on building the rotation system. It's not super simple but still easy for an expert. The installation of the billboard: I have the printed vinyl billboard in my studio in Bogotá right now. It could be sent to Boston but we would have to build the frame for it. I didn't take measurements, this was all built by the gallery before I arrived so I couldn't take notes on it. Based on the photos and what I was told it was an easy install, it just needs to be drilled to the wall and built with metallic tubes. This was all built using Home Depot stuff. 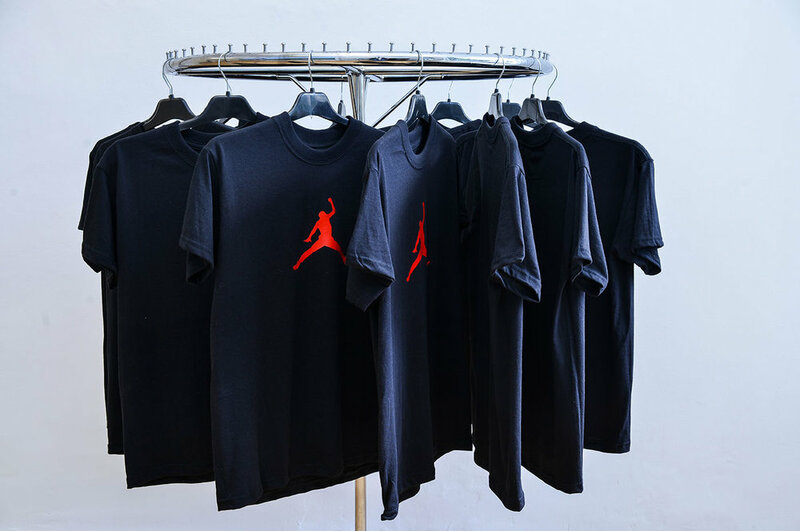 If we go with the idea of shelves with copies of the Supreme/Jordan Tees, we need to build/install the shelves and get a printer that would print the tees for us. I have not had good luck finding screen printers that would do small runs. We could get them printed in Colombia, but we would need to do this ASAP. If anything sells, I think we should go 50/50. Pat has told me that is not your model, but I believe we both are doing a lot for this to happen. I don't expect many sales but you never know. Also, if this seems to be too much work/investment for Distillery at the moment, please feel free to let me know. I think we all want the show to be the best it can, and if we don't have the resources/time to make it happen, I'm prepared to back off from it. You just have to let me know. Thanks Shane and Pat for this invitation, I would love to hear from you. I'll be back in Boston on January 11th.